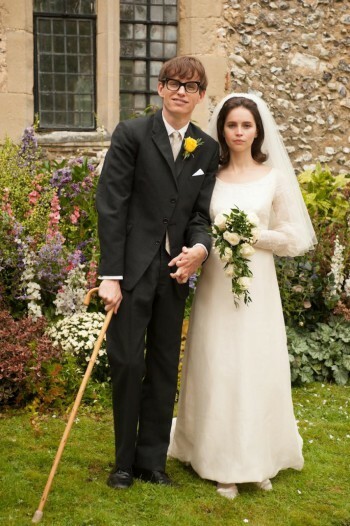 Starring Eddie Redmayne and Felicity Jones, “The Theory of Everything” tells the extraordinary story of one of the world’s greatest living minds, the renowned astrophysicist Stephen Hawking, who falls deeply in love with fellow Cambridge student Jane Wilde. When he’s 21 years old, the once healthy, active young man, receives the earth-shattering diagnosis that he has ALS (Lou Gehrig’s disease) and only two years to live. With Jane fighting tirelessly by his side, Stephen embarks on his most ambitious scientific work, studying the very thing he now has precious little of – time. The heart of the film, however, is about love and the complex relationship journey these two remarkable people take. This is a biopic, so reel life are real lives. Although crippling disability plays a major role in Jane and Stephen’s relationship, it can mirror the inspirations and challenges in our own relationships and enable us to learn by example. Here are some themes and lessons Frank and I think are universal, so Spoiler Alert! 1. The actors capture the terrific chemistry and emotional bonding Jane and Stephen must have had when they fell in love, After Stephen learns of his illness, he tries to shut Jane out, but she gives him an ultimatum: let me in or I’ll never come back. In that scene, we see how the strength of their love sets the course for their relationship. Neither can let each other go. They both become committed to fighting for his life and their future. Jane thinks she understands what that means, but does she? Strong and determined, Jane creates a rich family life, has three children, and becomes Stephen’s full-time caretaker. As his illness progresses, his locomotion, balance, speech and even swallowing are impaired, and she has to bathe, dress, feed and move him. There is no time for her own needs, passions or ambitions. Eventually she becomes drained, frustrated and angry. There’s that telling scene when she discloses to Stephen that she can’t go on and needs help in taking care of him. He resists. Yes, being a caretaker is one of the hardest jobs there is, and being a wife and mother is demanding and time consuming. It’s not surprising that Jane sacrificed her own well-being and that she couldn’t keep doing it. Women are prone to putting others, especially kids and family first, to their own detriment. Plus, most women also have a job. Where will they find the time for themselves? The hard lesson is: if you sacrifice yourself, there will be no self left. You will suffer and be unhappy and those around will eventually suffer and be unhappy. So, man or woman, you must figure out how to make your needs and joys enough of a priority so that you have the will and energy to give. And you may very well find that like Stephen, your mate and kids resist. If so, use that as fuel to change. Entitlement isn’t healthy. 2. Jane joins the church choir to find a personal outlet and meets Jonathan, the choirmaster, a warm but lonely widower. As he gets close to Jane and her family, we see their mutual need for connection and their growing attraction, as well as their conflict in doing anything about it. When Stephen finally agrees to go to Paris with a nurse instead of her, they take the kids on a camping trip. There is that moving series of scenes: Jane initiates their intimacy when she joins Jonathan in his tent after the kids are asleep. That very same night, Stephen has an episode and goes into a coma. Jane runs to the plane to rush to Paris, and the affair is ended. Jane and Stephen’s dynamic is that she gives a lot more to him than he does to her. Except for her demands for help, they don’t confront her needs or any of their problems head on. The warning is, if there isn’t an equal give and take in your relationship or if you can’t ask your partner for what you need and/or your partner can’t or won’t give you what you need, you will be open to finding someone who will. Unfulfilled people who do not work out their issues can have affairs. Doing nothing only makes matters worse. When we become alienated from our mates, it’s time for couple’s counseling. 3. After Stephen loses his ability to speak, Jane hires Elaine, a speech therapist to help him. Jane slowly slips away from him, and he falls in love with Elaine. Their marriage ends in that touching scene where Jane apologizes to Stephen by saying she’s sorry, she did the best she could. They can finally let go of each other and move on. Nowadays, the highest divorce rate is for couples 50+, with 60 percent being initiated by women. Could any of these marriages have been saved if the couples went to counseling? Maybe yes, maybe no. But it’s definitely “no” if the couple doesn’t communicate and their unresolved conflicts build to the breaking point. All relationships go through periods of harmony, disharmony and repair. It’s uncomfortable to work through problems, but each time we do, we grow as individuals. Our relationship becomes stronger because we can trust ourselves and our partner to work through difficulties. We made vows to each other. It’s worth the effort.